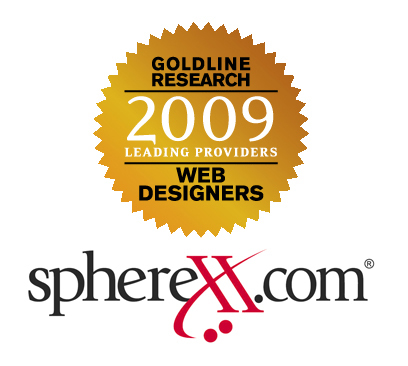 Spherexx.com has been named among a list of ten leading web designers by Goldline Research for the third consecutive year. Criteria for Goldline's annual selections are rigorous, based on research of seventeen distinguishing factors. Goldline reports that there are over 2,000 web design firms in the Central United States, and 1,300 were identified in the evaluation region. Goldline Research's mission is to conduct independent market research on behalf of consumers. Results are published at http://www.TheMostDependable.com and their industry-specific guides are free to the public. "We were especially delighted to be chosen again this year since the competition keeps growing from year to year," says Becca Wilson, President and CEO of Spherexx.com. "We so appreciate Goldline's recognition because it provides a valuable service to the public, our clients and our future clients. Their research is especially valuable in troubled economic times when there is no room to invest in a web site that is not fully functional, optimized, marketable or reliable. A web site can truly make or break a business depending on the expertise of the developer." "Those selected provide extensive client service that exceeds the industry standard," said James King, Analyst, Goldline Research. "We believe that they are setting the benchmarks for the industry as a whole." Additional information is available at http://www.forbescustom.com/marketresearch.html and GoldlineResearch.com. Spherex.com has been providing quality web design since 2000. "We have been privileged to serve many great leaders in the real estate, healthcare and mortgage industries. We enjoy both the challenge and opportunity presented by ever-advancing technology to establish our clients' competitive advantage. One of our company initiatives is to always have the most advanced web marketing strategies available for their success," states Wilson. Spherexx.com also contributes an interactive, educational website for apartment professionals at http://www.LeasingCafe.com ™. Ms. Wilson is a recognized industry speaker for Inman News Real Estate Connect, the National Multi-family Housing Council Technology Conference, the Apartment Internet Marketing Conference and the National Apartment Association Pillars Conference. Visit http://www.Spherexx.com for additional information. Her seminar presentations are available for free download, including the most recent presentation of "Making Money on Facebook" at http://spherexx.com/aim2009facebookinfo. Goldline Research, GoldlineResearch.com, is an independent market research firm that specializes in evaluating professional services providers to help consumers identify and select leading services firms. Goldline Research's proprietary research process includes market analysis, individual company interviews and, in many industries, interviews with consumers of those services to gain feedback on market conditions and provider service levels. Goldline Research's lists have been published in leading publications including local, regional and national magazines.